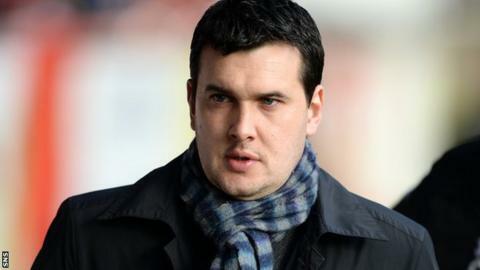 Dumbarton manager Ian Murray has signed a new two-year deal with the Scottish Championship club. The 33-year-old, whose contract was due to expire in the summer, guided the Sons to fifth place this season. And speculation has linked him with St Mirren's managerial vacancy following Danny Lennon's departure. "I'm glad everything's been sorted and we can get into the planning process for... an exciting campaign next season," Murray told his club website. Murray took up the reins at the Bet Butler Stadium in 2012, steering the Sons to seventh in that campaign. And this term they narrowly missed out on the play-offs. Dumbarton chief executive Gilbert Lawrie said: "We are delighted Ian has agreed to carry on the excellent foundations he's built at the Bet Butler Stadium."